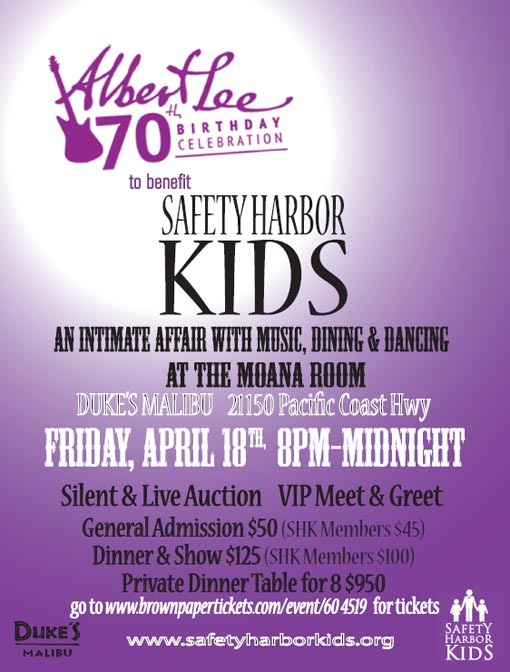 On Friday, April 18th Grammy Award winner Albert Lee, dubbed “The greatest guitarist in the world” by Eric Clapton, will bring his sold out 70th Birthday Celebration Tour to an intimate ocean setting in the Moana Room at Duke’s Restaurant in Malibu. An evening of music, dining and dancing with surprise guests, the event will benefit Safety Harbor Kids, a non-profit organization supporting orphans, foster and homeless children. Past and present supporters of Safety Harbor Kids include numerous Grammy and Hall of Fame musicians such as Vince Gill, Jimmy Webb, Bonnie Raitt and Rock and Roll Hall of Famer and Safety Harbor Kids Board Member, Jackson Browne. These amazing artists have donated, attended or performed at Safety Harbor Kids to lend their support in raising awareness for the cause and solution. To join these artists in supporting children in need please go to www.safetyharborkids.org or call 800-277-0497. Safety Harbor Kids is a members only organization.